I thought over the long weekend about what you said Dr. Tobi and yes, I have been uncomfortable for the better part of a two months. However, I have also had other ailments which your recommendation of pro-biotic has worked much better then the alternative medications I have tried during the same time period. Also, the fact that you were and are willing to look at alternatives as well as send me somewhere else shows me that you do care that I get better which means a great deal to me as well. On a positive note, I was able to play two games of pool yesterday which would have been unthinkable two weeks ago. Delivering gentle and effective chiropractic care and complimentary services to Concord, NH and all surrounding areas. We are so happy that you have discovered us and are considering becoming a patient in our office! Dr. Tobi Sheiker is the owner at Balance Chiropractic and Dr. Christana is the latest addition to our team..
We pride ourselves in not being your "typical" Doctor's office. 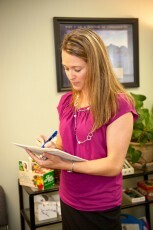 We use a chiropractic method that is not solely found in any other Doctor's offices in New Hampshire. We also do our best to make our office a refuge, where all patients feel welcome, relaxed, and comfortable. At balance chiropractic, we understand that your time is valuable, and we attempt to get all patients in for their care in a timely fashion. We also spend as long as is required with each individual patient and we will not rush through your appointment. We customize the care, since each patient is a unique individual and may have different requirements at each visit. We also are constantly learning and offering new and improved services to our patients in order to offer complete healthcare, including nutritional counseling, hormone consultations, and orthotics. We welcome all ages, conditions, and health levels. Our youngest patient has been 1 day old and our oldest is in her 90s. We pride ourselves in taking care of those patients that are hopeless and have been unable to receive help elsewhere. If this sounds like an experience that you would enjoy, give the office a call and set up your first appointment. We can't wait to meet you and your family! This service is considered for women (and men) that are having dysfunction of the endocrine system: thyroid, pituitary, adrenals, ovaries, etc. These are the glands that produce hormones in the body that determine metabolism, growth, moods, sleep, etc. This service is extremely helpful for women that are suffering from any dysfunction related to PMS, peri-menopause, or menopause. The symptoms that can be addressed range from endometriosis, infertility, PCOS, heavy bleeding or cramping, salt or sugar cravings, to hot flashes, lower libido, mood changes, and sleep difficulties. We can measure levels of hormones in the body, such as estrogen, progesterone, and testosterone to detect imbalances. Mostly all symptoms associated with the different stages of a woman's life are due to hormone imbalances. Other tests may be necessary, such as testing the efficiency of the adrenal glands and their output of cortisol, which affects energy levels, thyroid function, and blood sugar. We have teamed up with a lab called Diagnos-techs in California that specializes in saliva testing and we give you the test kit to complete at home and then you ship it directly to them. Once we receive the results, we have a consult where we discuss the choices and options for correcting your hormonal imbalances. These include whole food supplements and herbs, exercise programs, stress management, and dietary changes.